This week iOS 12 developer beta was first released to those who have an Apple Developers account, and will later be released to public beta testers. For those who desire to wait for the official launch date, will have to wait until this fall. Apple’s purpose, plan, and design for iOS 12 was to make it faster, more responsive, and just a better performance on the users’ Apple devices. 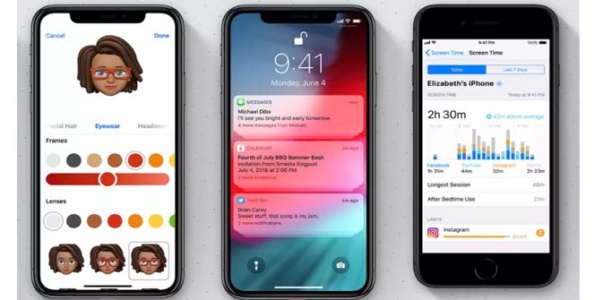 Some of the new features and improvements to look for is performance, this week at the WWDC Apple’s VP software engineer Craig Federighi took to the stage to emphasize the focus of iOS 12 is about performance, improving performance and eliminating bugs. iOS 12 will be compatible with any Apple device that runs iOS 11, which will include the iPhone 5S and AirPad. Once again, the key is performance, users should expect faster and more responsive experience all around, even with older model handsets. Users should expect up to 70% better performance swiping to Camera, up to 50% faster keyboard display, and up to 2x faster app launch when under a heavy workload. FaceTime will support video and audio up to 32 people at one time, Memoji is a new way to create animoji of yourself, which can be used in Messages and FaceTime. Also coming are four new Animojis- Koala, Tiger, Ghost, and a T-Rex. Augmented Reality (ARKit 2) objects will be able to be sent with Messages and Mail, look for a new AR app in iOS called Measure which will assist in measuring real-world objects. Another new feature is Screen Time, this feature will assist users to get a better understanding of the time they spend overall on their device such as using apps, visiting websites, etc. Siri Shortcut is a new app that allows the user to assign phrases to tasks, this new app can assist in travel plans, ordering coffee, as well as remind you when you’re running late. iOS 12 has much more to offer, as this software gets closer to launching to the public, stay tuned for further updates.